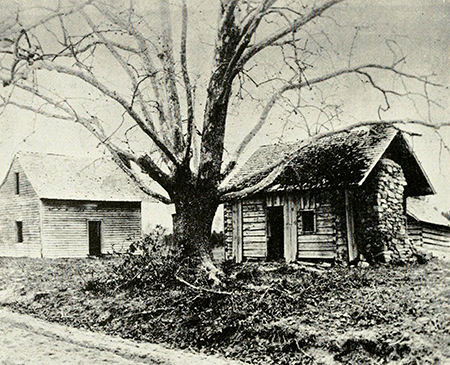 Bennett Place in western Durham was the locale of negotiations that led to the largest troop surrender of the Civil War. The farmhouse of James and Nancy Bennitt (as they spelled their name) was on the Hillsborough Road, seven miles from Durham Station and about midway between the Confederate army commanded by Gen. Joseph E. Johnston and the Union army commanded by Maj. Gen. William T. Sherman. Under a flag of truce the two commanders met at the farm three times to discuss a peaceful conclusion to a tragic war. After Sherman's initial agreement was disapproved by President Andrew Johnson, terms of a military surrender acceptable to both sides were reached on 26 Apr. 1865, 17 days after Gen. Robert E. Lee had surrendered his army to Gen. Ulysses S. Grant at Appomattox Courthouse in Virginia. Johnston's surrender affected 89,270 soldiers in the two Carolinas, Georgia, and Florida. It also spared North Carolina the destruction that had befallen neighboring states. North Carolinians, who did not like to recall the surrender, neglected the site for years. It was not until 1919 that Samuel T. Morgan of Richmond, Va., acquired the farm and talked of a park there; but the house, except for its stone chimney, burned in 1921, and Morgan died before the plans materialized. R. O. Everett of Durham, a member of the General Assembly, secured an agreement by which the state would erect a monument and maintain the site in return for a grant of 3½ acres. A Bennett Place Memorial Commission was created for this purpose, and in 1923 the Unity Monument was raised. Rather than mark the site of a surrender, it proclaimed national unity as demonstrated in the agreement between Johnston and Sherman. With the approach of the Civil War centennial, interest in the Bennett Place was revived in the 1950s and a reconstruction project was begun in 1960. A condemned house about the same age, size, and interior arrangement as the Bennett house was discovered in the vicinity. It was acquired and moved to the site for restoration. Declared a North Carolina State Historic Site, the restored house and separate kitchen were dedicated in 1962. An 1860 smokehouse was later moved to the site, and in 1982 a visitors center with an auditorium, library/research room, and museum were built. Mark L. Bradley, This Astounding Close: The Road to Bennett Place (2000). Arthur C. Menius III, "James Bennitt: Portrait of an Antebellum Yeoman," NCHR 58 (October 1981). William M. Vatavuk, Dawn of Peace: The Bennett Place State Historic Site (1989). NC Historic Sites - Bennett Place: http://www.nchistoricsites.org/bennett/ (November 2, 2012). Bennett Place State Historic Site. "Johnston surrenders" North Carolina in the Civil War and Reconstruction. LearnNC.org http://www.learnnc.org/lp/editions/nchist-civilwar/5620 (November 2, 2012). "An Act Providing for the Acceptance of the Bennett Place in Durham County, with a Suitable Marker Erected by the Family Of Samuel T. Morgan, and the Perpetual Care of Same." Public laws and resolutions passed by the General Assembly at its session of 1923. Raleigh [N.C.]: Commercial Printing Co. 1923. http://digital.ncdcr.gov/u?/p249901coll22,236422 (November 2, 2012). An act to provide for the acceptance of additional land at the Bennett Place and to appoint additional members of the Bennett Place Memorial Commission. Public laws and resolutions passed by the General Assembly at its session of 1925. Raleigh [N.C.]: Commercial Printing Co. 1925. p.3. http://digital.ncdcr.gov/u?/p249901coll22,236932 (November 2, 2012). 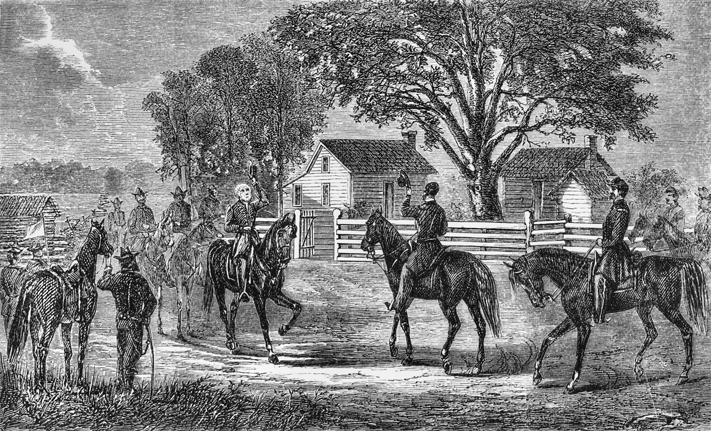 An 1865 engraving depicting the meeting between Gens. Joseph E. Johnston and William T. Sherman at Bennett Place. North Carolina Collection, University of North Carolina at Chapel Hill Library. I do not understand why the NPS has not adopted this site. It is wrong to let the public think the war was concluded in VA. We were floored then we first ran across this site, by searching the NC "what to do" and discovered it. Very informative.